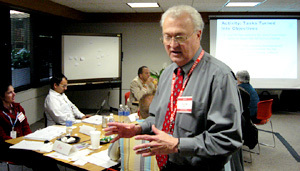 The Instructional Design Workshop (1 day) « Darryl L. Sink and Associates, Inc.
we actually do it, day in and day out. This is a comprehensive workshop specifically focused on design skills. You’ll learn proven strategies for designing and developing successful instruction and will be able to match your training to your company’s business needs. The one-day format allows busy course developers and instructional designers to concentrate on the critical design and development stages that make up the bulk of any training project. Training managers who want a clear, consistent design procedure for courses developed in their departments will benefit greatly from this workshop. In addition to the workshop that contains 10 dynamic lessons, 10 experiential activities, and hands–on design with your own projects, each participant will receive a personal copy of the 116–page Instructional Design Workshop binder. This workbook completely documents each topic covered and also includes job aids, a glossary, and bibliography. Identify objectives written in four different learning domains: cognitive, affective, psychomotor, and interpersonal. Choose from 17 message design principles that enhance the clarity and presentation of your training materials. Quickly produce an effective instructional design working with a three–part instructional design plan. Write instructional materials from scratch using proven, results–oriented techniques. Write key objectives and enabling objectives for one of your own modules. Apply principles for adult learners from over 40 instructional design suggestions. Develop training strategies for presenting four different types of content. Apply practice and feedback techniques, as well as a variety of activities to get students involved, including case studies, roleplays, and instructional games. Quickly and effectively test your instructional design, even with limited time and resources. Copyright, Darryl L. Sink & Associates, Inc.